installer stops when loading default show file. Disable HP Hotkey UWP Service + restart COM+ Event System. You’ll find the resources and fixes for that here. Ok i’m going to have a winge here. 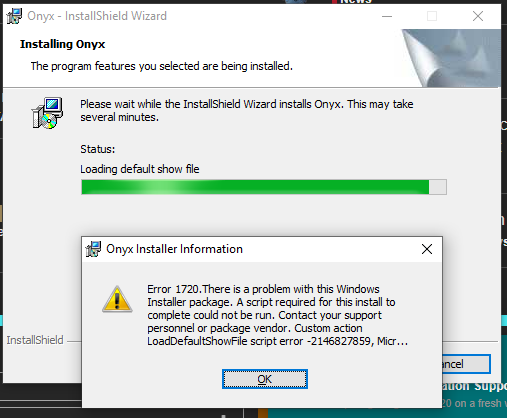 The ONYX installer the way I see it is broken. I have run the installer on three different machines that have never had Martin M-PC or ONYX installed. That is clean machines each one failed when attempting to access the localdb with error 1722 request to sql server timed out. The fact this happens on three clean machine concerns me, as the M-PC installers always worked fine. In my opinion the installer is broken and Elation need to fix it!. Can you try to install the last release version of M-PC on one of these? Same here although I’m getting Error 1720 as well as Error 27502… need a hand here. I myself cant return to last version, old version was on older laptop that motherboard fried. Sorry the Disable HP Hotkey UWP Service + Restart Com + Event System is a no go . have an error there and Onyx still won’t Load. My computer is an HP and so far from what i gather it works directly on Dell and Lenovo. hopefully i can find the fix soon. To take away error 1720 find here, on the forum file “FixCOM Dolby_Realtek.reg” and run it and allow it to add those entries to your registry. Next run “Component services” addin in control panel (for me it is easier, to run admin commandline there type “mmc” and there add the “Component services” addin, sorry, cannot give you exact solution - I’m using localized Russian Windows). Next open in the left pane folder something like “COM+ Applications”, click one by one it’s subfolders (only 1 level depth, not deeper), then click next folder “DCOM Settings”, in my case it offered to build the contents inside. Thanks Alex we are good to go.